Obit John Opel, one of the most successful leaders of IBM, died on 3 November at the age of 86. Opel climbed through the executive ranks as Big Blue transitioned from a peddler of tabulating machines and typewriters to the mainframe giant most people still perceive it to be today, and he took the helm of the company when the PC started storming the glass house. According to the statement released by IBM over the weekend, after getting his MBA at the University of Chicago in 1949, Opel had two job prospects. One was editing economic textbooks, and the other was helping his father run a hardware store in Jefferson City, Missouri, where he grew up. These are about the prospects you would think that someone with a BS in English literature (which he got at Westminster College in Missouri before getting that MBA) would have. Opel was a life-long fisherman and bird watcher, and on a fishing trip with his father and a family friend, who also happened to be an IBM sales manager selling various business equipment in Missouri, Opel was offered a job as a sales rep at Big Blue. And after more than three decades, he ended up running a much bigger and powerful hardware store: IBM at the height of the mainframe era and at the dawn of the commercial PC era that it helped establish. As is often the case at IBM, the executive assistant chosen by a sitting president or CEO is often a sign of who will be fast-tracked at the company. In 1989, when IBM was at its peak in the mainframe era and John Akers was president and CEO – and the company's mainframe biz was about to drop off a cliff thanks to the triple-whammy of PCs, x86 servers, and Unix servers – it was Sam Palmisano, who will step down as president and CEO of IBM in January 2012, that was tapped to be assistant to Akers. Three decades earlier, in 1959, it was Opel who got the call from IBM's Armonk HQ to be the executive assistant to Thomas Watson, Jr, the son of IBM's founder. And it was Watson Jr that put Opel in charge of IBM's moonshot, the April 1964 launch of the venerable System/360 mainframe. The System/360 mainframe involved a multi-year, $5bn hardware and software development effort at a time when IBM was making $3bn a year selling time clocks, typewriters, and various kinds of electromechanical tabulating equipment. The combination of the System/360 architecture, which allowed machines with different scales and processors to run the same code, and the 1956 Consent Decree (which settled a 1952 antitrust lawsuit relating to the punch card business) that opened up the specs of the machines, the modern computing era launched. In hindsight, Opel's rise at IBM was pretty straight, but like other top IBM managers, he did a lot of different jobs. Following the launch of the System/360 mainframes, Opel was named a vice president in 1966 and was put in charge of finance and planning two years later. 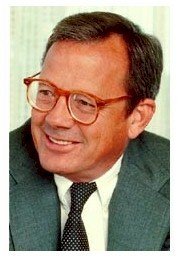 In 1972, Opel was put in charge of the Data Processing Product Group, the mainframe family jewels, and was named president of the company and heir apparent in 1974. It is not that many leaps from those System/360 machines to IBM's System/3X midrange systems to personal computers, and Opel not only saw it all but made sure IBM didn't miss the PC boat. As president of IBM in 1980, it was Opel who got the go-ahead from then-CEO Frank Cary (who was CEO from 1973 to 1981) to set up the skunkworks in Boca Raton, Florida, that created the IBM PC. A lot of other people who put together personal computers, but the one you are reading from today very likely has its heritage in this IBM PC. Opel was friendly with Mary Gates, who ran the Seattle branch of the United Way on which Opel was a board member, and it is this relationship that probably scored Bill Gates his deal to supply the MS-DOS operating system for IBM's PC. IBM had a love-hate relationship with the PC, and it is perhaps unfortunate that Opel turned 60 – the traditional retirement age of IBM CEOs – in 1985 and left Big Blue in the hands of John Akers, a Yale man who was perhaps the most polished salesperson IBM ever created but one who thought of computing as mainframe computing.